A response to Ewan Gurr of The Trussell Trust writing in The Herald on Sunday 26 July 2015. I will not call Ewan Gurr stupid. And if he is an idealist then I will not criticise him for that. It is a sad reflection on the politics of the British state that calling someone an idealist might be considered an insult. I will, however, call Ewan Gurr naive. 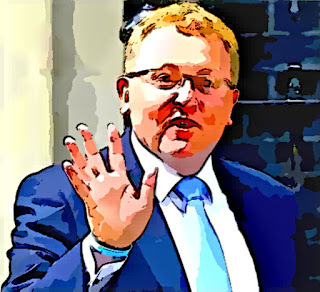 He is naive to imagine David Mundell might listen to him or be influenced by his accounts of the impact of austerity fetishism on real people. He is naive to imagine that there can be meaningful dialogue with the administration Mundell represents. Ewan Gurr is naive to suppose that the ruling elites can be made to care by any appeal to normal human empathy. The story of Suzanne will not touch these people as it evidently does Mr Gurr. Such tales leave them cold. Even if they actually heard what was being said, they are incapable of relating to hardship and distress. And even if some vestige of humanity remained which allowed the faintest glimmer of fellow feeling to glow in the foetid murk where once resided a human soul, the ember would be instantly doused as a sign of deplorable weakness and betrayal of the cause. The cult of austerity is a rigid, heartless ideology. To the limited extent that they might see it at all, the adherents of this cult see the suffering of others as, alternatively, a misfortune entirely of their own making, or a "price worth paying" for what they absolutely believe to be a "greater good". Their programme involves nothing less than a forced reordering of society such that the fate of Suzanne will not be exceptional as economic and political power increasingly accrues to the elites who are the true and sole clients of the likes of Mundell. What we are witnessing is the unabashed use of imposed poverty as an instrument of policy. People are being made poor in order that they will be neutralised as a possible threat to the power of those who are, in the eyes of Mundell and his ilk, the only ones deserving of power or capable of exercising it responsibly. With the responsible exercise of power being defined as that which serves those who exercise power. Ewan Gurr needs to realise that the likes of Mundell cannot be talked out of the circularity of their own self-justification. Like a religious creed, the cult of austerity is entirely self-rationalising and impervious to reasoning which references anything that is external to its own reality. I don't doubt that, in inviting David Mundell to open a foodbank, Mr Gurr's intentions were entirely honourable. They were also completely and utterly futile. The conditions which necessitate foodbanks will not be addressed by talking, however earnestly and passionately, to those who regard those conditions as inevitable, necessary and desirable. Those conditions will only be addressed by removing the likes of Mundell from power - while we still can. In the early hours of the morning of 19 September 2014, I was at one of the referendum count centres where I watched as people who had spent the previous two years loudly and repeatedly proclaiming their credentials as "proud Scots" cheered the humiliation of the country they claimed to love. Of course, from their own perspective they were doing no such thing. They were celebrating variously a tribal victory over a political opponent; the defeat of dangerous democratic dissent; and/or the triumph of British nationalism. Mostly, they were just relieved that they had succeeded in preserving the old order and the old ways. The structures of power, privilege and patronage which define the British state had been challenged by a popular grass-roots movement, and that challenge had been seen off. The ruling elites remained in place. Established power was undiminished. Everybody could get back to business as usual. That's not quite how it was to turn out. But it would be some time before I came to realise that the British establishment may have won the vote, but the people of Scotland were to take all the prizes. At the time, I witnessed only self-proclaimed "real Scots" revelling in the fact that Scotland had declared itself unworthy to be a nation as other nation. I saw only people reacting to the diminishing of Scotland with uninhibited joy. More recently, I read accounts of MPs in the House of Commons cheering the defeat of amendments to the Scotland Bill which would have taken it some way towards honouring the promises by which the No vote was secured. They were openly congratulating themselves on having thwarted the efforts of the vast majority of Scotland's MPs to secure the powers for the Scottish Parliament that were agreed by the Smith Commission. They were applauding (figuratively, of course) the fact that the democratic will of the people of Scotland counted for nothing against the might of the British state. They were vociferously celebrating the affirmation of Scotland's subordinate status in the UK. The British establishment has declared its response to the election result which saw the parties of the British establishment all but wiped out in Scotland. The ruling elites have given their answer to the 50% of the people of Scotland who, by voting for the SNP, demanded only that which we were assured was our due as part of the UK. Namely, a powerful parliament in Edinburgh and a strong voice at Westminster. That answer could be most succinctly expressed in the vernacular. Essentially, it was a curt "No!" to the powers we asked for and a contemptuous "Forget it!" to our demand for simple respect. The British state had declared its position. 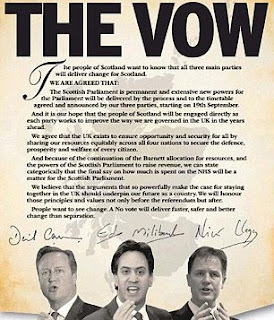 Its power trumped any "vow". Never mind what was said about Scotland's rightful place in the UK. Henceforth it would be English votes for English laws; English votes for Scottish laws; and no Scottish votes for English laws. Just as Scotland had been branded inferior in the world by the referendum, so Scotland was to be confirmed as totally subordinate in the UK and, to drive the point home, our democratically elected representatives were to be declared second-class members of the British parliament. I read about those who had lately professed their "love" for Scotland cheering all of this, and I was sickened. Then I see the rather more sly and surreptitious pleasure being taken in the plight of Greece. I see the sleekit manner in which people such as Peter Jones in The Scotsman pounce on the situation in Greece, not to condemn the rapacious cabal which has brought Greece to this pass, but to mock Scotland's aspirations and insist that there is no choice other than to submit to the very system which has failed us all so disastrously. I see how Greece's travails are being gleefully exploited by Europhobes and British nationalists alike, and I am sickened. If you are desperate enough to seek a silver lining in all of this, consider only that where you see humiliation, insult, wanton disregard for democracy and callous exploitation of the powerless by the powerful, others see an excuse for a party.